One morning, it was not yet light; thin fog prevailed and, a cacophony of birds in the kitchen garden shattered the early morning tranquility. Some squirrels too joined the bandwagon and the commotion reached a crescendo, prompting us to ferret out the reason. Birds were hovering atop wood apple tree. Our Dog too was letting out occasional barks. Amidst all the din and clamour, we spotted a cat on the higher branches of the tree. Presumably, the dog chased the cat, and, the harried creature took refuge in the tree, much to the dislike of the birds who always regard cats with suspicion. The dog was chained till the cat came down and the drama ended happily with peace returning. 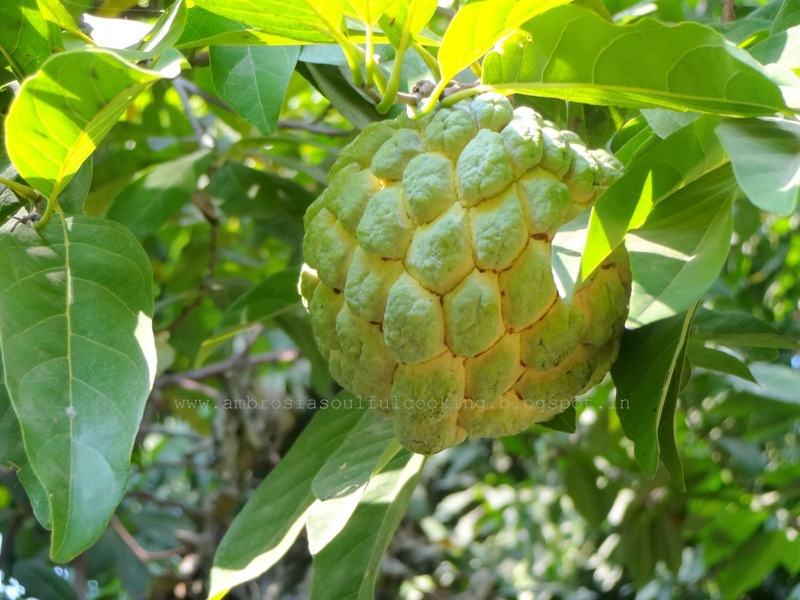 A custard apple tree in our garden is laden with fruit. First prerogative is of the birds who love pecking the ripe fruits. We pluck later. This year the bumper harvest was shared between the birds, our neighbours and us. 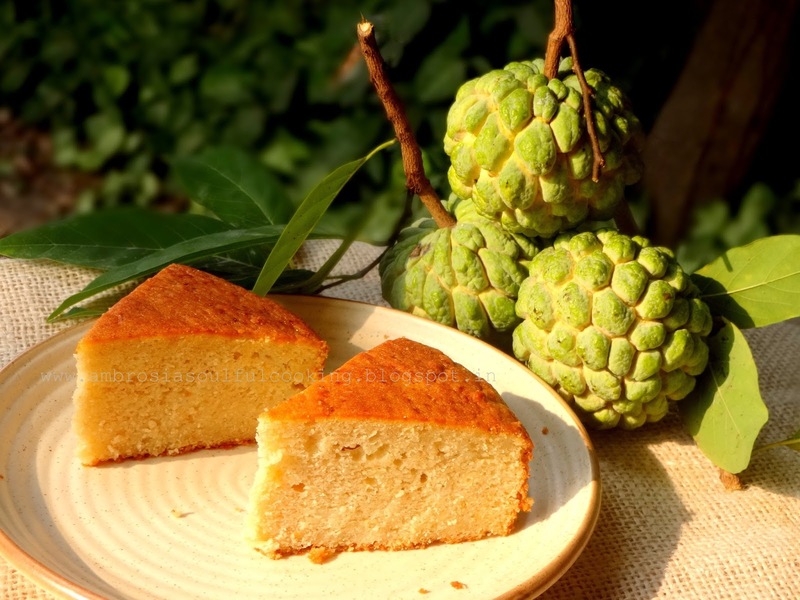 Some fruits were enjoyed plain, while two were used in a cake. It was an experiment that was undertaken reluctantly but was a success. The cake has a unique flavour and sweetness of custard apples. Remove pulp from the custard apples. Mash pulp with hands. Remove seeds. Beat egg whites till frothy. Beat butter and sugar till light and creamy. Add yolks. Add custard apple pulp and vanilla essence. Add egg white. Stir well to get a uniform mixture. Now add flour mix in three shifts. Every time you add flour, add warm milk. Stir till you get a lump free batter. Pour batter in the prepared tin. Bake for 35 to 40 minutes till the top turns brown and a toothpick inserted in the center comes out clean. Remove from the pan. Cool in the rack. Slice next day. Wow! A very unusual version of cake. Looks delightful, tender and moist. Love the beautiful golden colour on the crust. Thanks again for a lovely recipe. I guess you can vey well play with ingredients and come out with a vegan version. 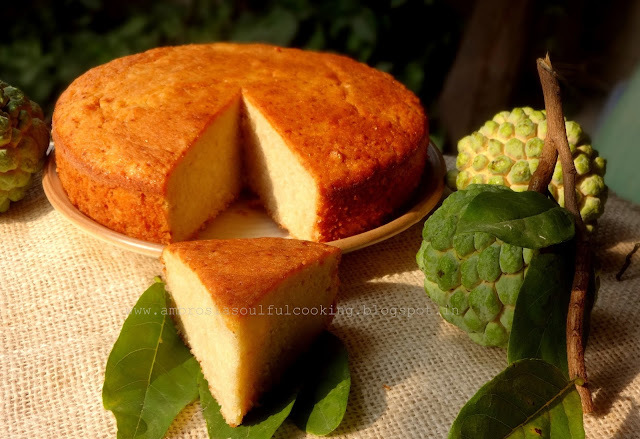 Custard apples really lend a great texture to the cake. 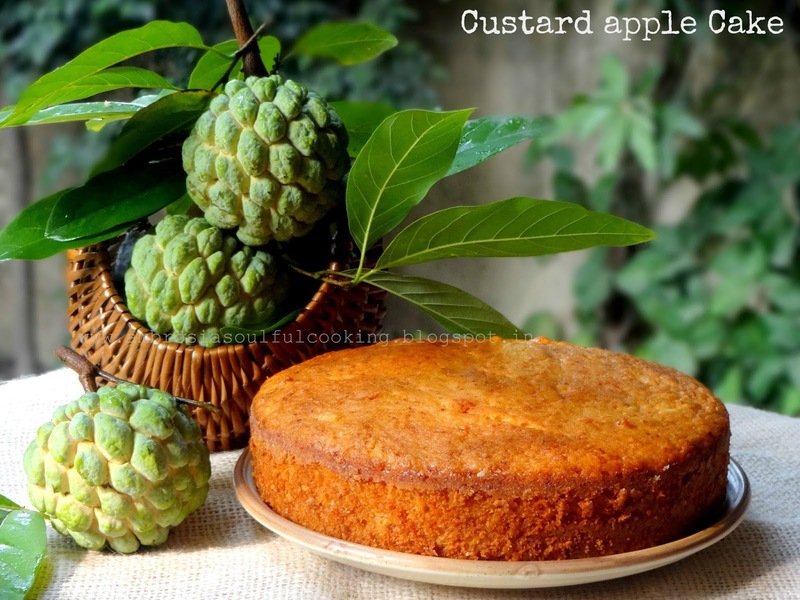 Tempting fruit and yummy looking cake ! Wow!Simply Aweosme namita..Loved Loved Loved this cake! Hello Swati, you must try it out. I am sure you'll love it. It has a great texture and taste. Awesome looking cake. 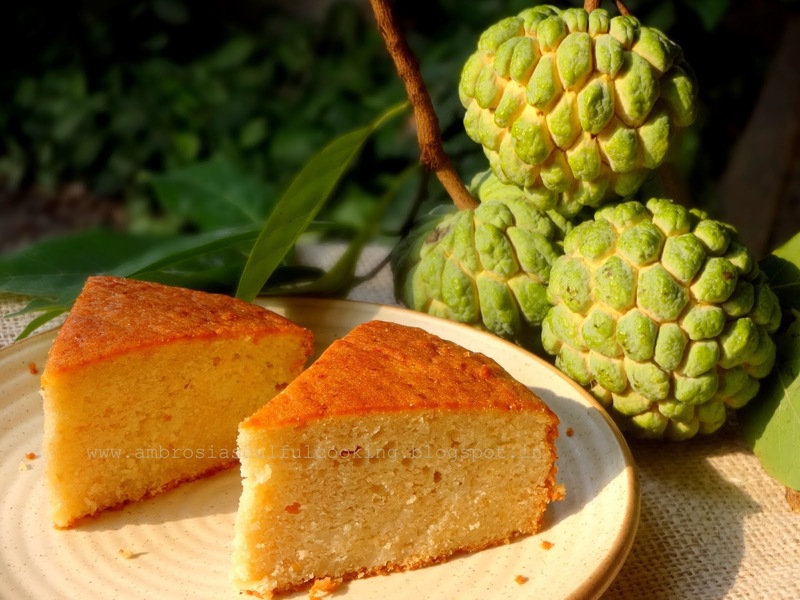 Would love to taste it but unfortunately we don't get custard apples here. By the way is it possible to substitute with any other fruits? Is it possible to make to make it eggless? And the most important doubt, how to get a flat top cake like yours? I admire your photos and the comments you give about your winged guests. Keep posting more. Good luck. Hello Bhuvana, You may try with any flavourful fruit preferablly pureed. How about chikoos? You'll get a lovely flavour and a gritty texture. Do let me know of your experiment. To get a flat top, i do not make any effort. If your ingredients are at room temperature, measured properly and if the batter consistency is right, you will definitely get a flat top. This is a very unique cake. I have 1 kgs Sitaphal pulp in fridge and was browsing for cake and was lucky to find your blog. Hello Cynthia, I use the standard 240 ml cup. According to that, 1 cup flour is 120 grams. 1/2 cup four is 60 grams. One stick butter is 100 grams that is the standard pack we get in the stores. I have used unrefined cane sugar. 1 cup powdered sugar is about 115 grams. Cynthia, please refer to this link for conversions. Hope this helps. Happy Baking! You may also try custard apple kulfi from the blog.